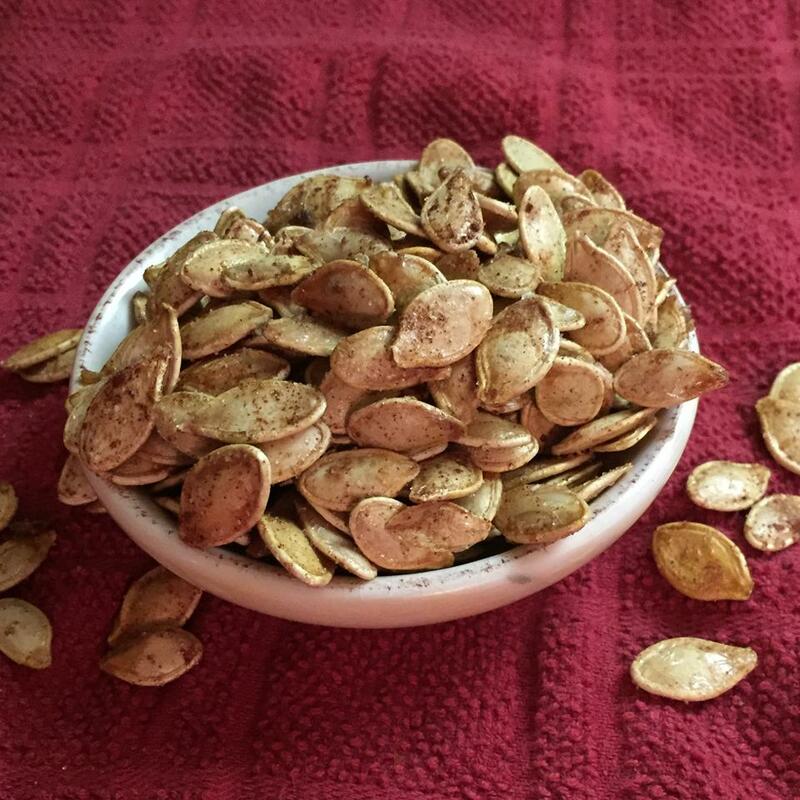 My husband asked if I could make a sweet pumpkin seed batch from all the pumpkin seeds we got from carving jack-o'-lanterns. 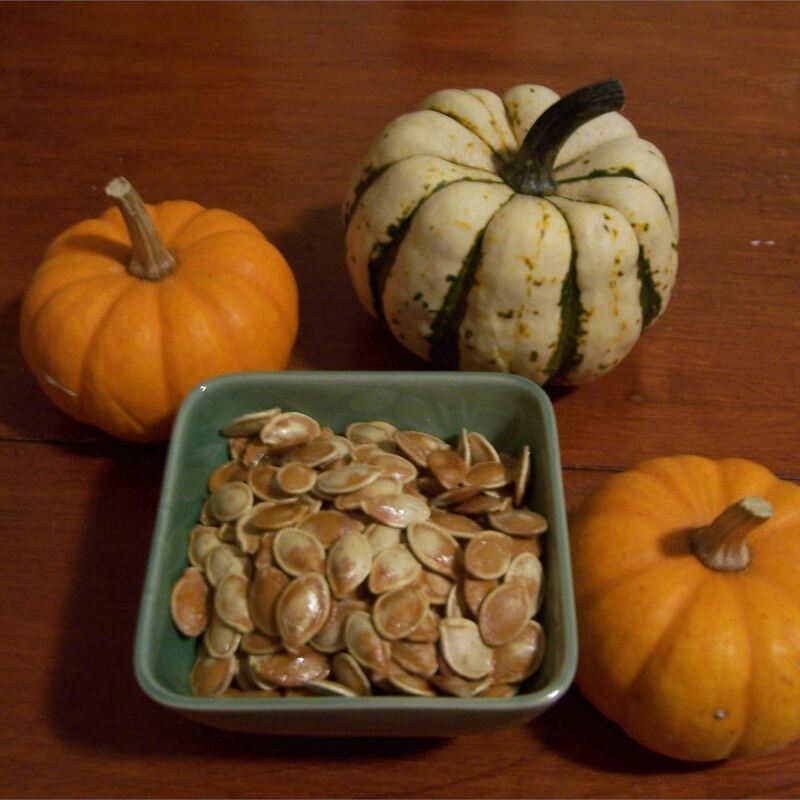 Remove all the pulp and strings from the pumpkin seeds, then wash and thoroughly dry the seeds. 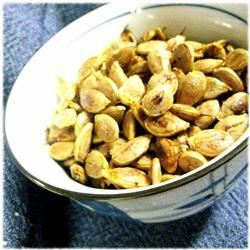 Place the melted butter in a bowl, toss the seeds in the butter to coat, and pour them onto the prepared baking sheet. 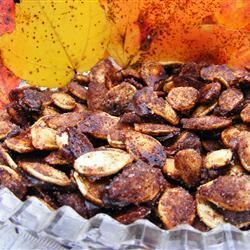 Sprinkle about 2 tablespoons of sugar and 1 teaspoon cinnamon over the seeds, stir the seeds around to mix the coating, and spread them into a single layer. 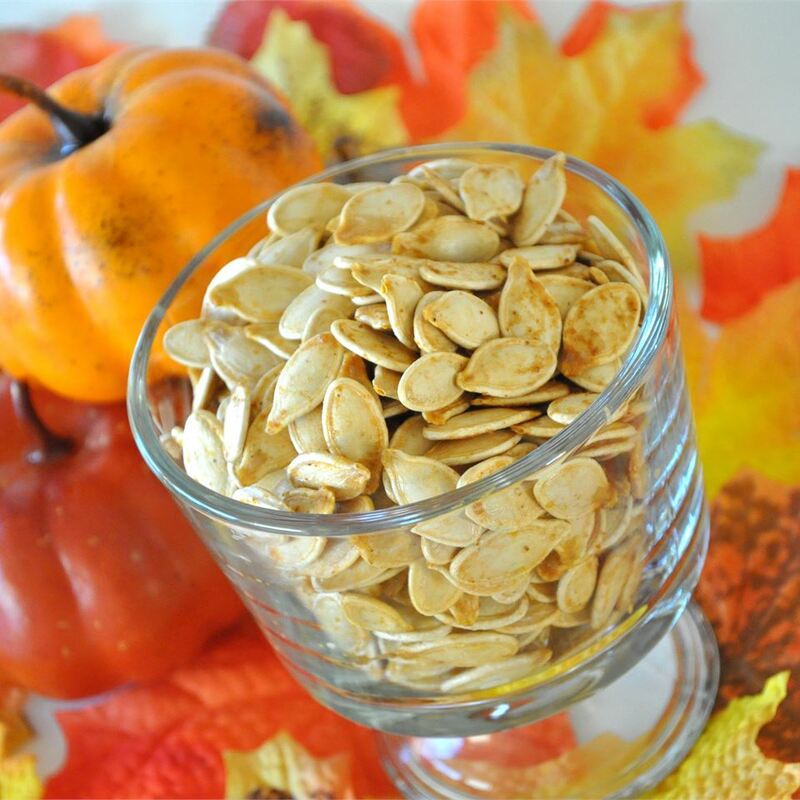 Bake the seeds in the preheated oven for 5 minutes. 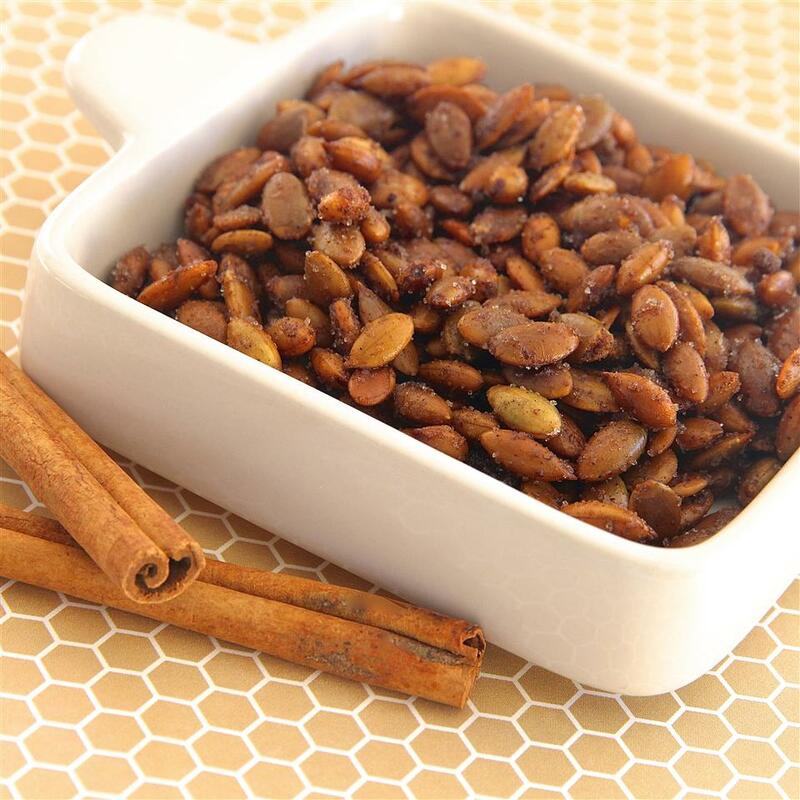 Remove the seeds from the oven, and sprinkle them with another coating of 2 tablespoons sugar and 1 teaspoon cinnamon, mixing the seeds together and spreading them out as before. Bake 5 more minutes. 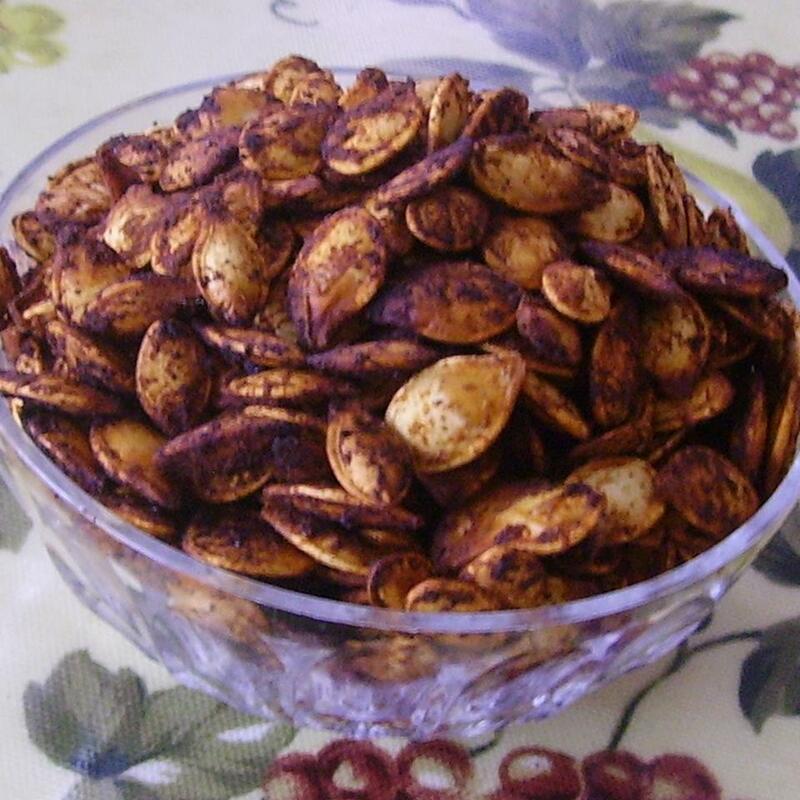 Repeat the coating and baking step one more time, and bake the seeds for 5 more minutes. 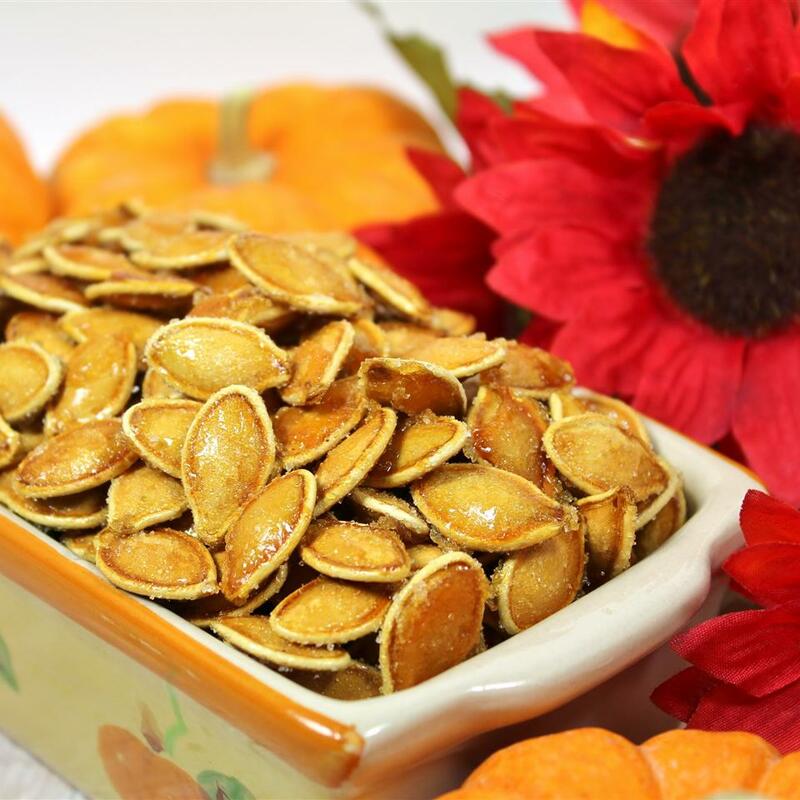 Sprinkle the seeds with the remaining 2 tablespoons of sugar, mix, and bake the sugar coating onto the seeds, about 10 more minutes. 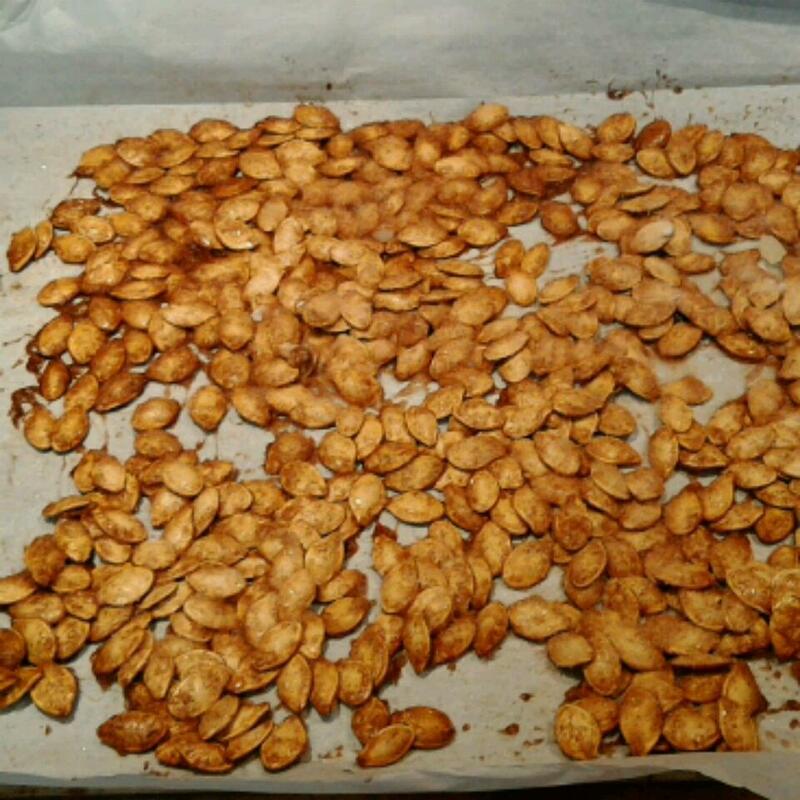 Let the seeds cool on the baking sheet before eating. 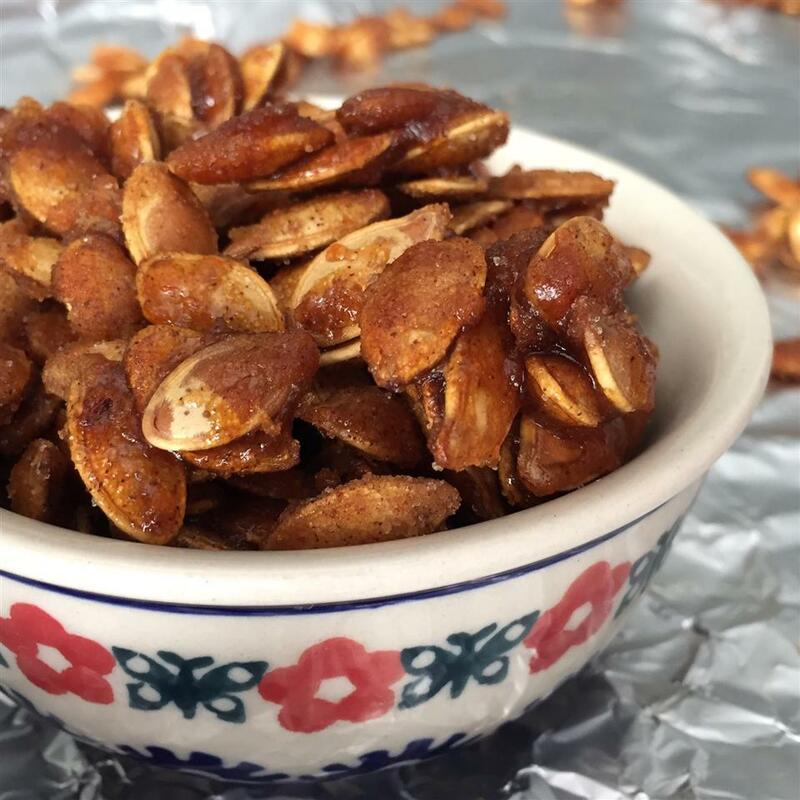 I put these in the oven while guests were arriving at my son&apos;s birthday party. 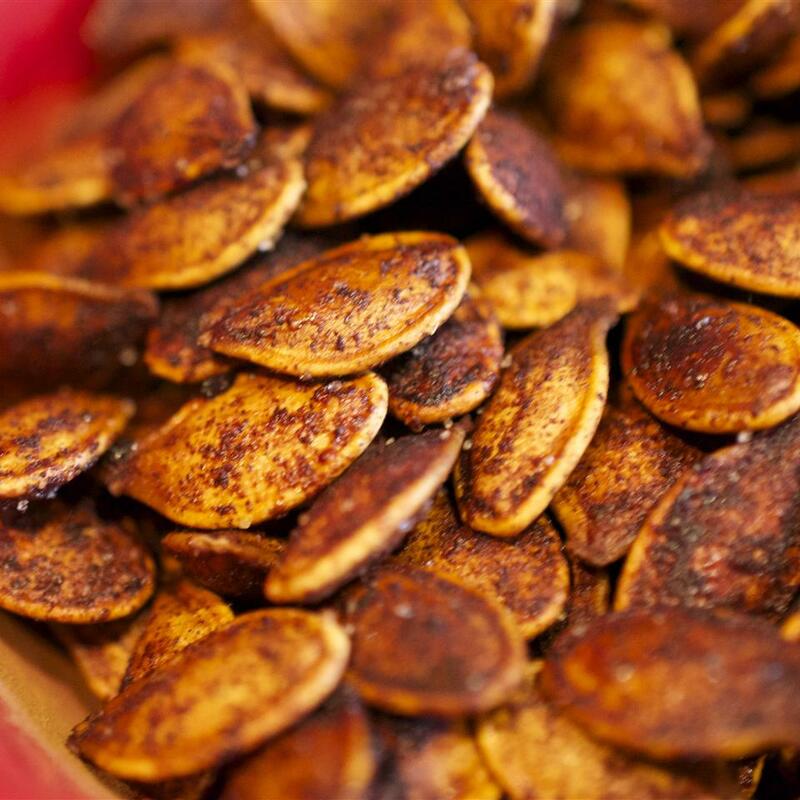 The aroma of cinnamon filled the house and they were a hit with the guests. 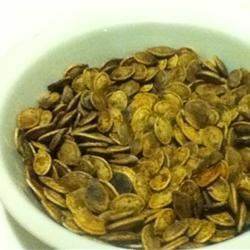 I had about four cups of pumpkin seeds that were soaking in salt water overnight. 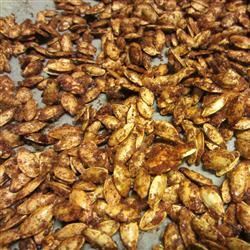 I dried them in the oven for about 15 minutes at 350 degrees and then added the sugar and cinnamon and turned them every 10 minutes because of the moisture in the soaked seeds. 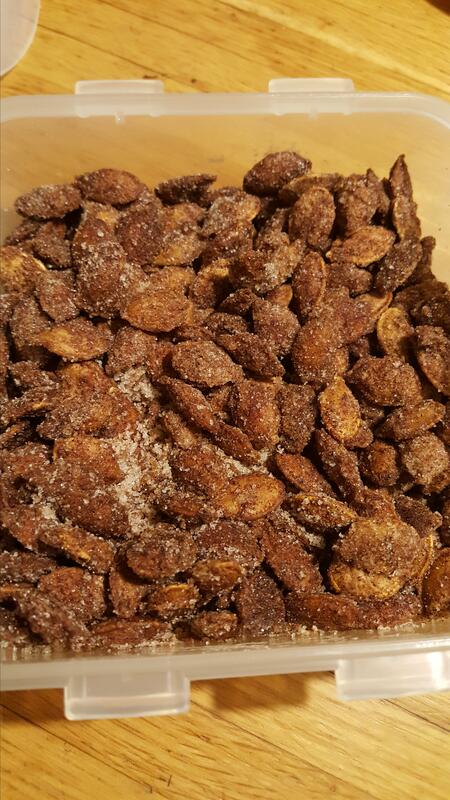 They were nice and crunchy with a sweet and salty taste. 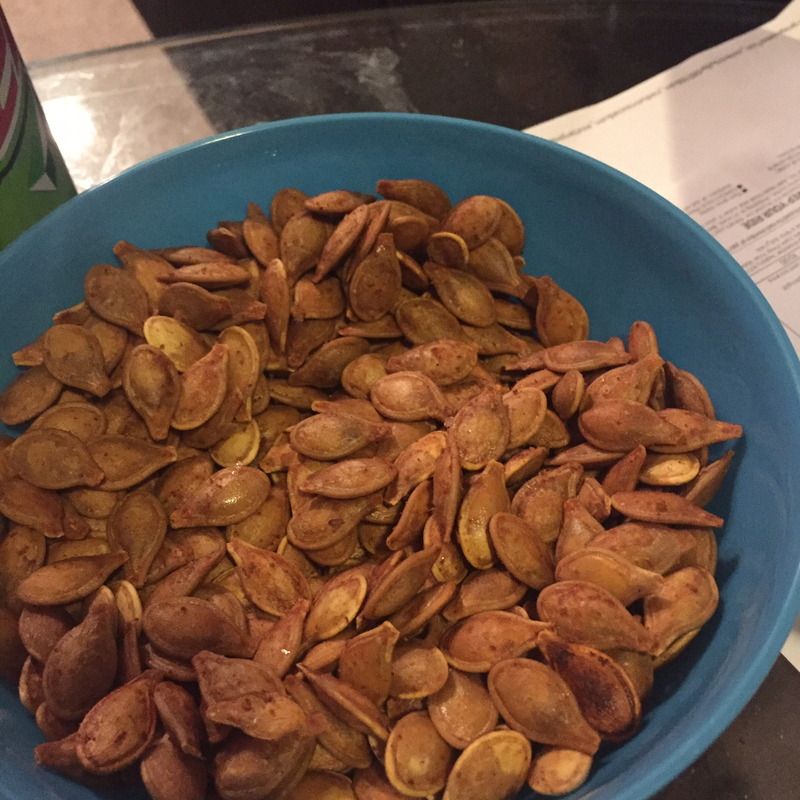 I started eating them and couldn&apos;t stop. YUMMY! 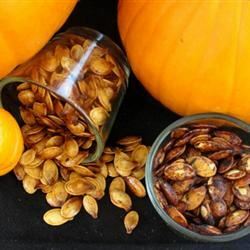 I&apos;ve always done roasted seeds with salt and decided to try a sweet version this year... this recipe was pretty good but not really what I expected. 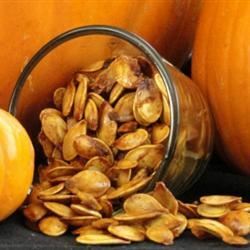 They were very well coated and crunchy - almost like a caramel corn and if you ate them with your eyes shut you&apos;d be hard-pressed to know there was a pumpkin seed underneath. I think they would have been fine without the last one or two coatings. 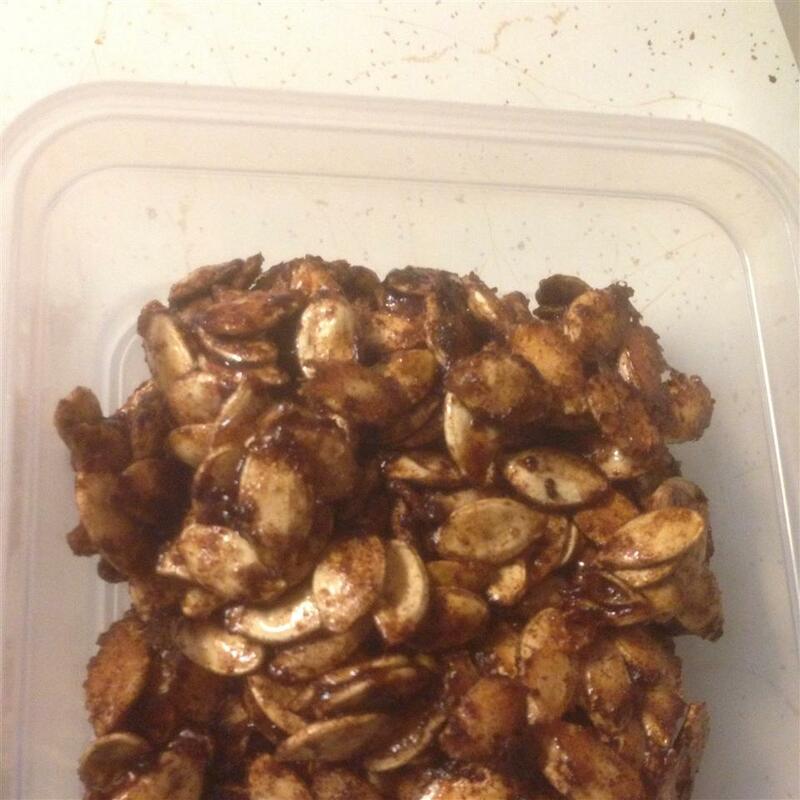 I did not have parchment paper and just used a lightly greased cookie sheet and it seemed to work out okay. 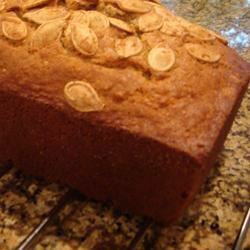 The flavor is a nice change from the norm but the texture and recipe gave me a little trouble. 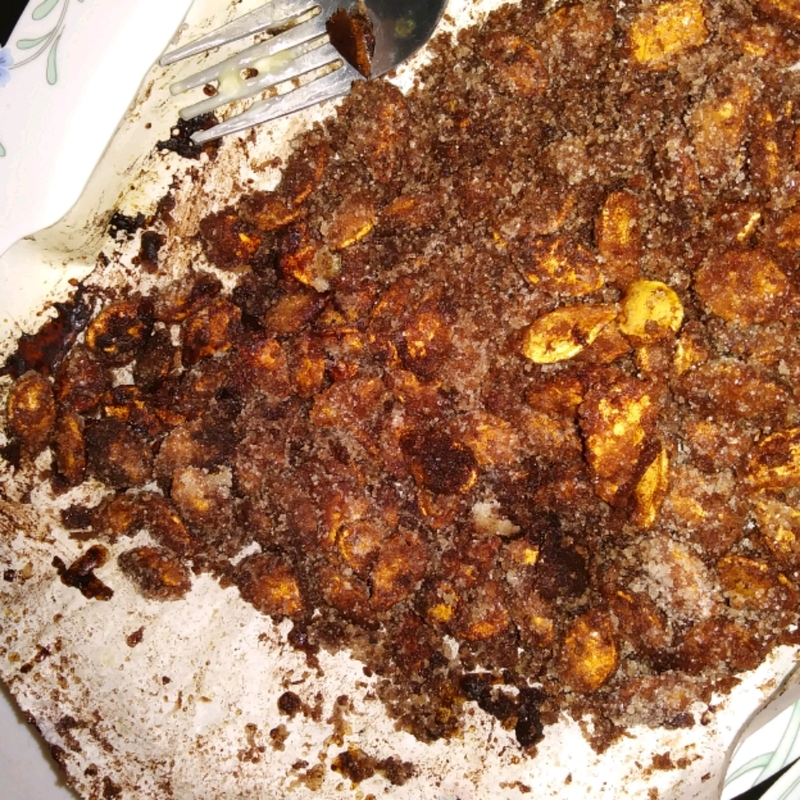 Everything was going great until the last addition of the remaining 2 TBS of sugar and the last 10 min in the oven. 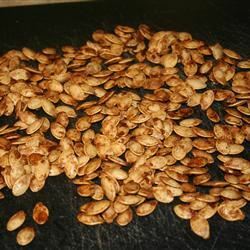 The final bake resulted in the sugar burning a little quickly melting and spreading out and making more of a "brittle" out of the seeds. 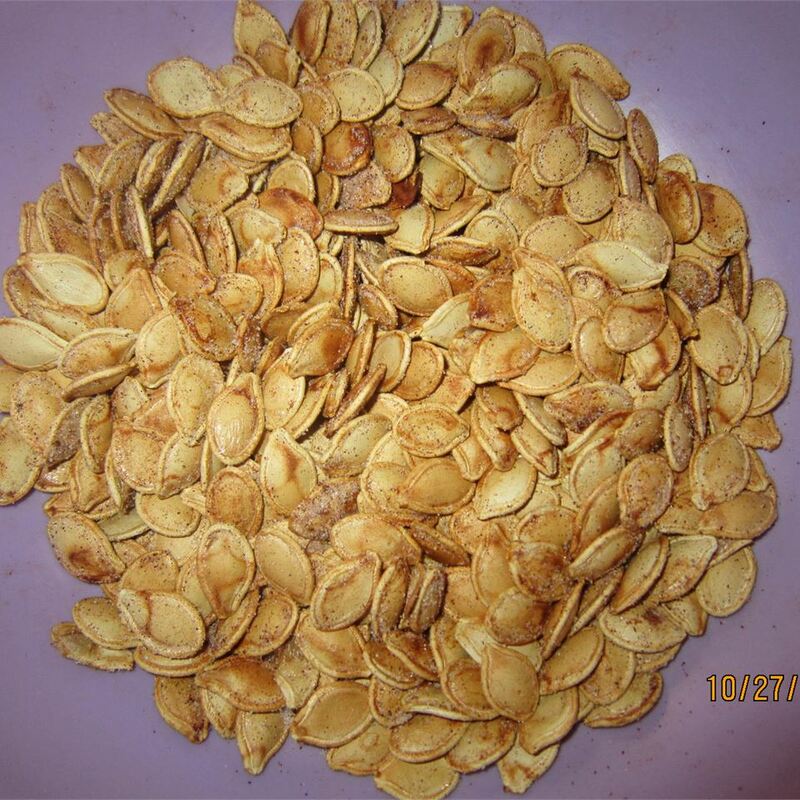 As "christalmiron" mentioned they had to be individually broken apart and the excess "brittle" broken off each seed. 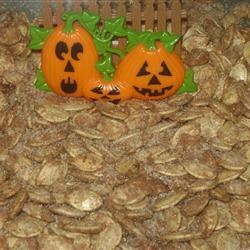 The pumpkin is lost a little under all the sugar and cinnamon but the coating flavor is very good. 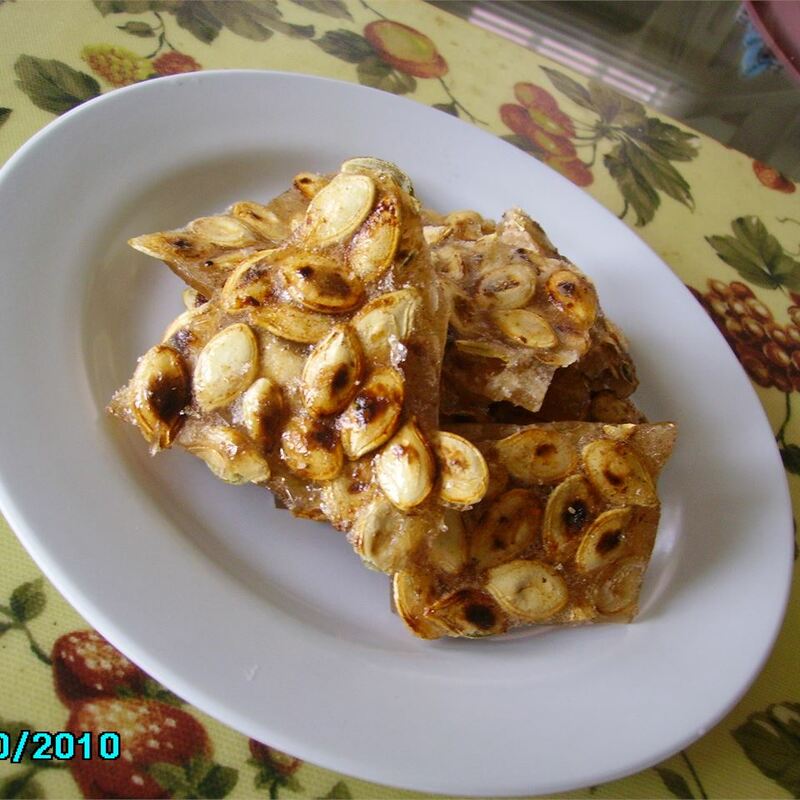 We enjoyed trying a new recipe and I will try again and watch them very closely toward the end. Thanks for sharing! 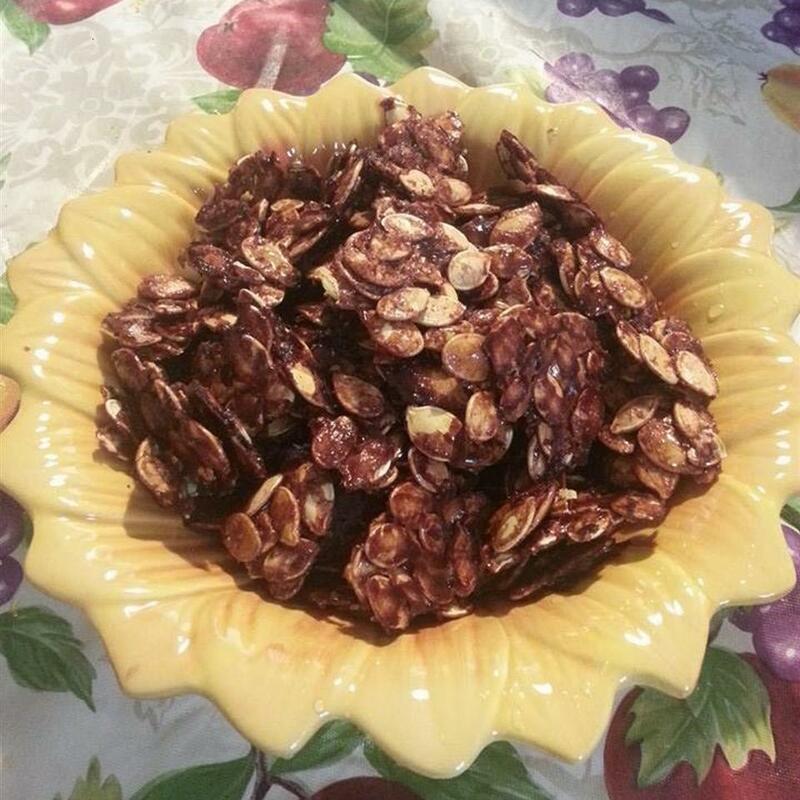 they have a pretty good flavor but they are a mess to make. yummy and perfect. 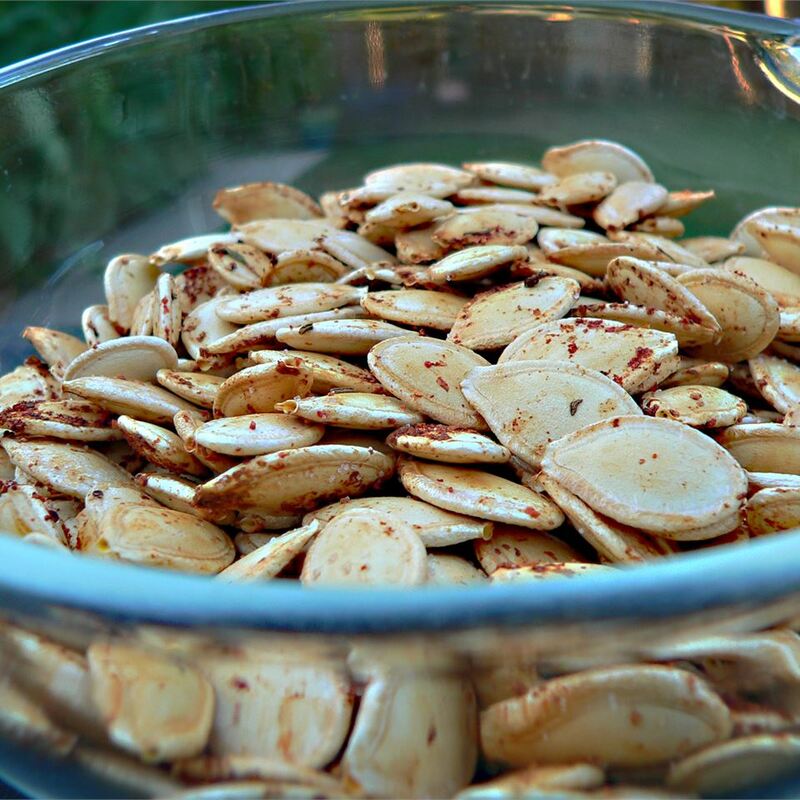 I don&apos;t even like pumpkin seeds usually but these are good. I followed the recipe to the letter except I think I used about 2.5 TBS of butter since that is what I had left of one stick. I had no issues with it turning into brittle at the end. as soon as I pulled it out of the oven I stirred it and tapped any clumps with the edge of my spoon so maybe that was the trick. 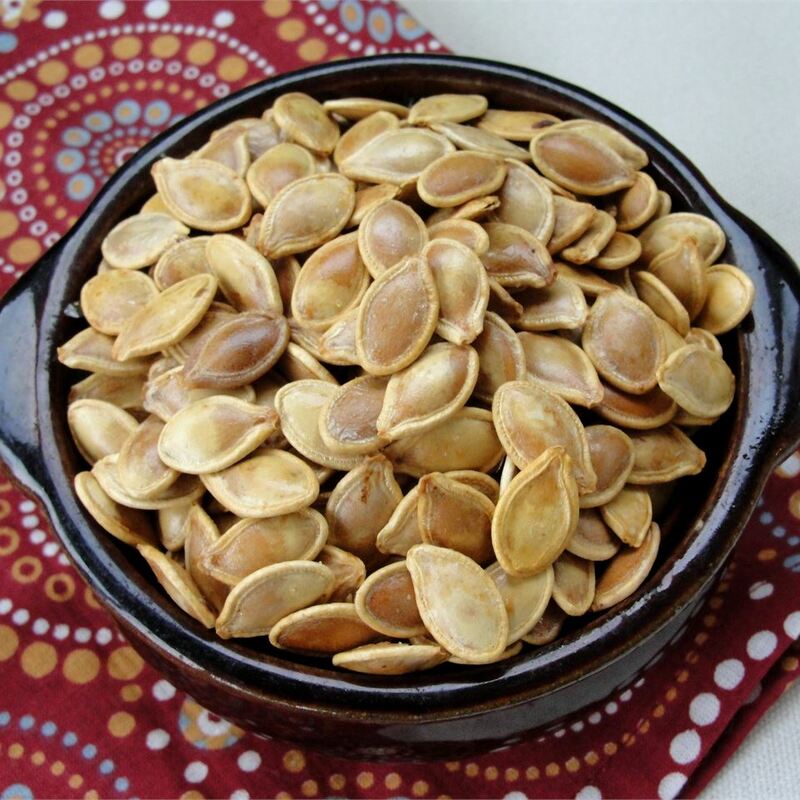 Oh and per one suggestion I dumped the seeds back into the bowl I used to coat them with butter and Cin/Suger the first time and stirred them in that after each baking cycle so again maybe that help my seeds to stay separate. These turned out really good! 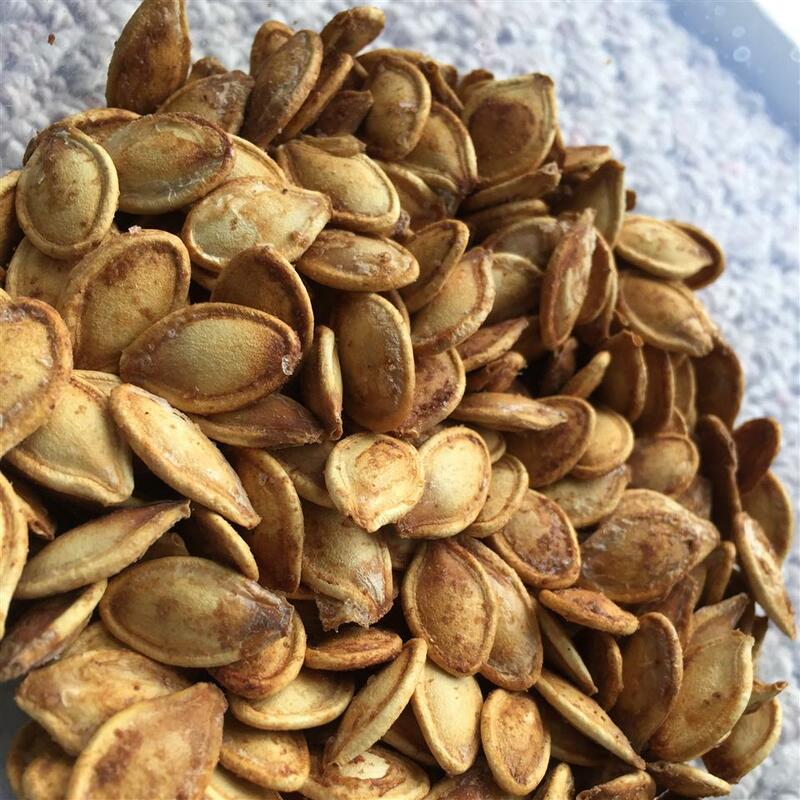 I&apos;m not a huge fan of pumpkin seeds but wanted my kids to try them and I have to say I was impressed. They were easy to make and not messy at all... 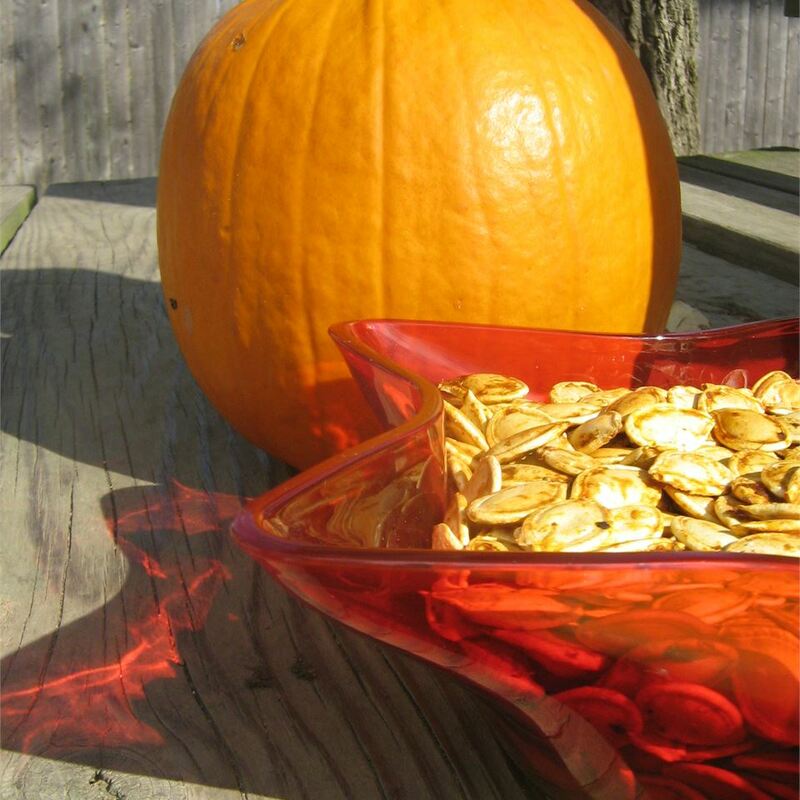 I didn&apos;t have parchment so I used aluminum foil and lightly sprayed it with cooking spray. 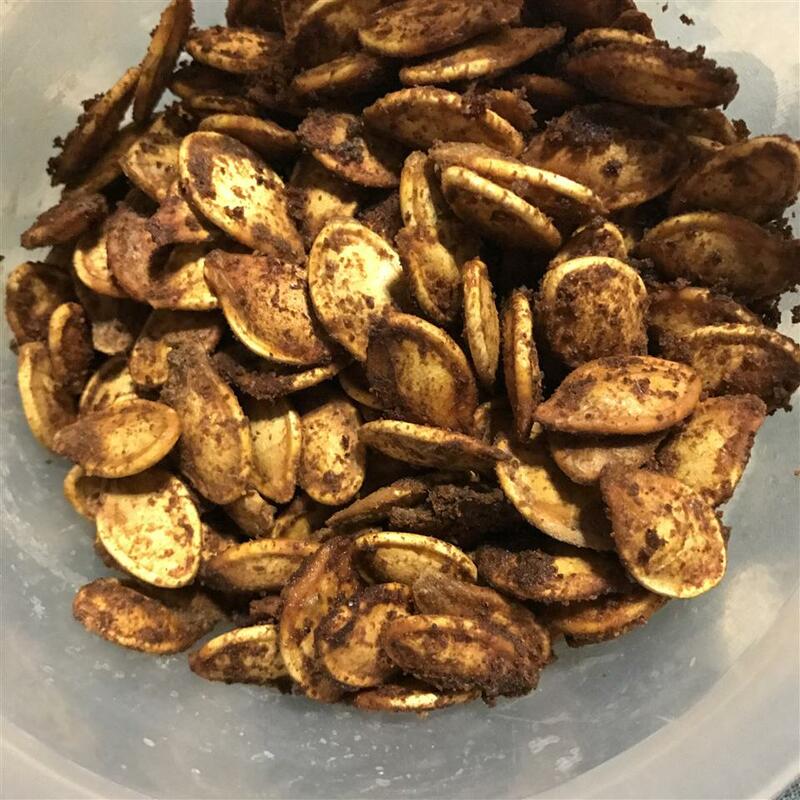 I stirred the seeds and butter in a bowl to coat then added the cinnamon and sugar (per recipe instructions)... stirred again to coat and baked... at each interval I put the seeds back in the bowl to mix and recoat. Had to cook an additional 10 min to get the consistency I wanted but other than that I didn&apos;t change anything:).